‘What is the Sangha?’ This is the question that we’re asking ourselves here at Windhorse Publications for the last few months of the year. We’re going to be discussing the question in relation to some of our books, and ask our authors for their insights and views. We’d like to know what you, our readers, think too. What does the Sangha mean to you? Is it your local Buddhist centre, your friends, your family, your colleagues? The Sangha is traditionally one of the three highest ideals of Buddhism, alongside the Buddha and the Dharma. But why? We’re used to seeing images of the Buddha seated alone, deep in meditation. We’re used to thinking of him as a heroic individual who disassociated himself from his social group, his parents, his wife and even his child in search for truth and freedom. In this context, it can be quite a surprise to find that Buddhism gives great importance to the Sangha. So why are human relationships so essential to the Buddhist path? We’re going to start by using Sangharakshita’s What is the Sangha? as our guide. In What is the Sangha: The Nature of Spiritual Community, Sangharakshita puts forward the idea that spiritual community is not about unthinking conformity or belonging to a comfortable group. Rather, it is the free association of developing individuals choosing to help each other along the path. So to explore the nature of the spiritual community is also to examine what makes us true individuals, what it means to be truly human. A large section of What is the Sangha? therefore discusses the nature of the individual and considers the individual’s relationship to others – friends, family, fellow workers and spiritual teachers – and the way the Buddhist community is connected to the world as a whole. The Sangha, Sangharakshita suggests, is all about relationships. Throughout the book Sangharakshita demonstrates his passionate commitment to the ideal of the Sangha, in principle and in practice. How can we help each other, and the world, towards a more enlightened way of living? How can we be good friends to one another? Sangharakshita’s vision shapes and enlivens this book, transforming Sangha from an idea to an inspiring and practical ideal. We’re left with some food for thought: What benefits can our spiritual community offer to the wider world? Does the Triratna community in its current state come close to Sangharakshita’s ideal Sangha, or are there areas that we need to work on if we are to be called a Sangha in the true sense of the word? 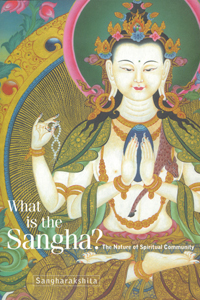 Sangharaksita’s ‘What is the Sangha?’ is available to purchase at your local Triratna bookshop and from the Windhorse online store. Have you read ‘Who is the Buddha?’ and ‘What is the Dharma?’, the other two books in Sangharakshita’s triology?